Will Procion MX dyes work at higher temperatures? Hi there, I was wondering if fibre reactive dyes will work at higher temperatures? I have trying to dye a rayon blend fabric black without success with procion MX dyes. I even used so much dye and salt that I was having difficulty dissolving it! Anyway I found an alternative dye that works really well but it requires setting at 60 degrees and was wondering what the effect of a high temperature would be on the procion dyes. I would like to use the new black to mix with with procion dyes if possible. What fiber is the rayon blended with? 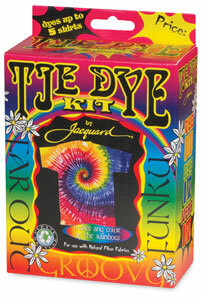 And what dye are you using, that is working better than Procion dye on rayon? Is it working better just because it is a more intense color, or does it somehow like rayon especially well, or is it also dyeing the other fiber that your rayon is blended with? 60°C, which is 140° Fahrenheit, is a good temperature for a lot of fiber reactive dyes. It’s the ideal temperature for Remazol type fiber reactive dyes. It’s not a bad temperature for Procion MX dyes, though it is warmer than they need. The effect of warmer temperatures on the Procion MX dyes will be to make them react more quickly—with whatever they are right next to. If you wait until the Procion dyes have soaked well into the fiber you want to dye, this is no problem at all. In fact, extra warmth can be helpful in getting the best possible color intensity from your Procion dyes, if your studio temperature tends to be a little cold, or if you don’t want to wait as long for the dye reaction to take place. If you apply too much heat immediately after adding the dyes to the fiber (or the fiber to the dyebath), it can speed of the dye-fiber reaction enough to encourage ring dyeing, in which only the very outermost layer of each fiber gets dyed. What happens as a result is that even the slightest amount of wear can degrade the color, as the dyed layer wears off. Ring dyeing is a fault that you want to avoid. If you apply a lot of heat when the dye is still mostly in the water, most especially if you’ve already added the soda ash or whatever other chemical you’re using to raise the pH, the dye immediately reacts with the water, so then little dye is left to react with the fiber. Letting the Procion MX dye soak in well before you heat it up will make sure that everything is fine. How much time you should allow depends on how thick the material is. Fifteen minutes is fine if it’s thin and the dye is circulating freely; if the material is thick, or if you have the material tightly crammed into a small container for low water immersion dyeing, you’d do better to allow an hour. See my page, “What is the effect of temperature on fiber reactive dyes?“. Depending on how much heat you need, there are many different ways to supply it. This entry was posted in fiber reactive dyes, Procion MX dye on February 23, 2015 by pburch.